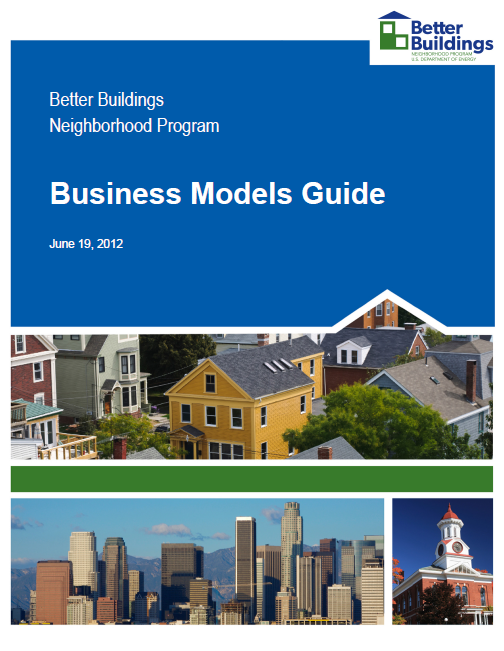 Better Buildings Neighborhood Program Business Models Guide is a resource for those interested in entering, or expanding their services in, the residential energy efficiency market. The guide also aims to enhance understanding of critical market players as organizations identify partners for long-term growth. Better Building Residential Program Implementation Plan Template - Market Position & Business Model will help you design a strategy for developing, operating, and evaluating your business planning activities. A vibrant residential energy efficiency market provides the benefits of reduced energy use, improved public health and safety, lower energy bills, job opportunities, and a better environment. The first step in entering this market is to define your organization’s niche in the market for providing energy efficiency services, also known as your market position. You can then use your established market position to create a viable business model – the overarching administrative and financial structure of the organization – before designing and implementing a residential energy efficiency program. To position yourself appropriately in the market, you will need to understand the energy efficiency value chain and what it looks like in your market. A value chain highlights all key participants and how they interact to deliver value to customers. It includes the actors with whom you may cooperate or compete with in the marketplace; the products and services these actors provide to customers; and the policies, incentives, and other factors that shape how actors operate in the market. Your organization’s strengths and capabilities to provide products and services in the market. Your vision, mission, and goals provide the overarching direction for your organization and should form the basis of all strategic and tactical decisions related to your residential energy efficiency program. You will need to identify strategic partners, clearly define their roles, and engage them early on to ensure you build common understanding and strong support for your business model. Once the foundation is in place, you are ready to develop your organizational business model. Although business models have common elements, including service offerings, customer targets, governance structure, and financial structure, they vary widely depending on organization type, revenue sources, and external operating environment. For example, an organization can administer an entire program (or multiple, distinct programs) or outsource part or all of program administration functions and operations to private businesses or non-governmental organizations (NGOs). Organizations can be funded through utility ratepayer funds, public funds, fees-for-services, or a combination of these and other types of revenue sources. Your organization’s unique mix of business model elements will determine how any given actor will be affected by various financial incentives, regulations, and fluctuations in the market, and will ultimately help you determine whether to move forward with a residential energy efficiency program. Source: Better Buildings Neighborhood Program Business Models Guide, U.S. Department of Energy, 2012. If you choose to move ahead, the next step is to develop a business plan detailing the organizational and financial structures and processes that you need in place to be able to operate in the capacity you choose (i.e., to implement your selected business model). You will also want a plan in place to regularly evaluate your market position and current operations to determine if any changes are needed in your overall approach or business plan in order to maintain your organization’s relevance and long-term viability. Developing organizational resources (e.g., management and operational systems) is a key component of meeting your goals and maintaining a strong market position. You can improve the effectiveness of your organization by evaluating and analyzing data sets, which will help diagnose organizational strengths and weaknesses. Communicating organization-level impacts is critical to sustaining long-term stakeholder support. Once your organizational details are solidified, you will be able to better design a sustainable residential energy efficiency program. These handbooks provide more detail on designing and implementing a cohesive and balanced residential energy efficiency program. The following are important stages for successful program administrators to follow when implementing Market Position & Business Model activities; however, no two programs are the same, and program administrators need to take into account the unique aspects of their market to create the most effective approach possible. Select each stage to access its handbook. To develop a successful business model, Better Buildings Neighborhood Program partners found it critical to have a strong understanding of the external environment within which they operated. This included who their customers were, who their competitors and partners were, what key policies governed their work, and what trends were likely to impact their ability to accomplish their goals and fulfill their mission. Understanding the external forces that affected their market allowed the organizations to better identify services that met customers’ and partners’ needs and develop a more robust business model. Many organizations adapted their business model to overcome challenges and leverage opportunities as local conditions and their understanding of how their business operated within the market evolved. When the New Hampshire Better Buildings program began, there were numerous energy efficiency programs operating independently in the state (e.g., by multiple utilities), and only informal coordination among activities was occurring. Customers were often overwhelmed trying to determine which programs they qualified for, how to fill out all the required paperwork, and which contractors they were able to work with. The program quickly learned that their business model needed to be well-integrated with other energy efficiency programs in the state, in order to provide value to customers and contractors while enabling long term growth for the efficiency market. In response, the program took a collaborative approach to their business model design and partnered with the utilities’ rate-payer funded Home Performance with ENERGY STAR (HPwES) program. Combining programs leveraged the utility programs’ existing queue of upgrade projects, procedure for assessments and upgrades, and database for collecting information about each project. A single program and process also made the most sense for residential customers, who were more likely to move forward with a project if they did not have multiple programs and processes to figure out. The utility companies benefitted from the partnership because the additional funds from Better Buildings allowed them to expand their program’s reach. Combining efforts and utilizing each program’s strengths led to consistent marketing and messaging, more efficient processes for contractors, one-stop shopping for customers, and a streamlined approach to financing. The Neighbor to Neighbor Energy Challenge’s (N2N) original program design used community-based social marketing (CBSM) to acquire and feed leads into the existing ratepayer funded Home Energy Solutions (HES) assessment program. N2N expected that contractors would convince customers to take advantage of rebate programs to complete home energy upgrades; however, over the first two years of the program, they saw many of the leads they generated stall after the assessments. N2N realized that they had limited influence over the contractor network with this approach and that the HES program design did not incent contractors and customers to complete upgrades. They shifted their business model and focused marketing and outreach resources on new strategies, such as direct lead acquisition, in order to acquire customers who were more likely to proceed straight to completing upgrades. In order to craft a sustainable financial model, organizations need to identify long-term sustainable revenue sources. As with the Better Buildings Neighborhood Program, grant funding can be a great way to get an effort off the ground; however, grant funding does run out, leaving the need to secure alternate revenue sources. Many Better Buildings Neighborhood Program partners overcame this challenge by aligning revenue opportunities with gaps or untapped potential for business in their local market. In some cases, several years were needed to gain trust and demonstrate results before funding was secured, so the sooner you begin considering options, the better the chances are of finding and securing one that is viable. Consider a wide range of options and pursue those opportunities that best match what your organization and local market have to offer. See a detailed list of potential funding sources in the Market Position - Develop a Business Model handbook. In 2010, St. Lucie County in Florida was awarded an Energy Efficiency and Conservation Block Grant and created the Solar and Energy Loan Fund (SELF), expecting that property assessed clean energy loans (PACE) would be an integral part of the residential loan structure. When Freddie Mac and Fannie Mae challenged the residential PACE system nationwide, SELF shifted direction. They evolved through a multi-year process into a certified community development financial institution (CDFI) focused on energy efficiency and renewable energy upgrades for the residential sector. They targeted low and moderate income populations that had been especially affected in Florida by the economic crisis in 2009. The change meant that SELF no longer had access to capital from investors seeking highly secured and profitable investments through PACE; however, becoming a CDFI allowed SELF to diversify its products and receive new types of support in the form of grants for technical assistance and loan capital. By becoming a certified CDFI, SELF was able to attract capital from banks as Community Reinvestment Act (CRA) investments and establish legitimacy in the eyes of other socially responsible investors. For example, in the last year of operating under the Better Buildings grant, SELF contacted faith-based foundations that seek to make socially responsible community investments. Over the year and a half after the Better Buildings grant, SELF raised an additional $835,000 from 5 different religious organizations. Under their business model, SELF faced some challenges limiting their ability to attract capital. For example, even though they implemented new policies to have Uniform Commercial Codes and a more strict collections process, capital providers are still wary of the fact they provide “unsecured” loans. Nevertheless, SELF’s portfolio results of less than 1% default and less than 3% delinquency helped prove that they had a good evaluation method and their risk management procedures were effective. The new CDFI business model allowed SELF to become self-sufficient by providing a platform to offer financial and non-financial services that could generate diversified revenue streams. These revenue sources include interest and fees earned on their investments; fees from off balance sheet portfolios such as commercial PACE; and fees from partnering with other financial institutions to sell their financial product and other activities such as contractor training. Programs that have developed strong and lasting partnerships have done so by identifying shared goals and seeking ways in which programs and partners can mutually benefit by advancing each other's missions. Even if partners don’t have the same goals as your program, you can still try to find ways to work together that improve the success of both efforts. Several programs have established forums for regular communication with partners, such as a steering committee or stakeholder group that meets monthly or quarterly, to maintain collaboration and communication. Informal events—such as engaging with partners after hours in a social setting—have proven to be successful at building trust and camaraderie. One key lesson from programs that have established robust partnerships: remember that partnership development often takes more time than planned. Explore this Partnerships Toolkit by the Better Buildings Residential Network for more on partnership development and stakeholder mapping. The Better Buildings Program San Jose leveraged local, well-known organizations that delivered non-energy services to low-income residents to help the program reach interested homeowners. Most Holy Trinity Catholic Church and the local Boys and Girls Clubhouse offered the program space for events where they could meet with homeowners, teach them more about the program, and schedule home energy assessments. To help low-income residents cover the cost of home energy evaluations and upgrades, the program also created a partnership with Pacific Gas and Electric’s Moderate Income Direct Install program (which offered free home energy assessments and weatherization services to income-qualified residents) to allow all program customers into the utility’s program. To learn more about the Better Buildings Program in San Jose, see the case study “San Jose, California, Partners with Established Community Groups to Win over Homeowners”. Early in its program, EnergyWorks in Philadelphia established a partnership with its local gas utility, Philadelphia Gas Works (PGW), to share lessons learned and customer information, including sharing energy use data once customers authorized its release. This partnership helped PGW enhance its own energy efficiency programs by applying the knowledge learned about home energy upgrades from EnergyWorks. The partnership also provided PGW customers with access to EnergyWorks’ loan program. For EnergyWorks, the partnership gave it access to PGW customers for marketing. Learn more about the partnership from the case study “In the City of Brotherly Love, Sharing Know-How Leads to Sustainability”. EnergyWorks found that by the end of their Better Buildings Neighborhood Program grant period, they had identified a successful formula of marketing, outreach, and contractor interface. They wanted their lessons learned to be useful in the future continued working with the city-owned utility, Philadelphia Gas Works (PGW) to develop a new utility-run energy efficiency program. This program built off and mirrored the design of the EnergyWorks program by incentivizing comprehensive, whole-home residential energy efficiency projects. EnergyWorks’ role changed to providing training and acting as a general contractor, which gave it more flexibility. PGW was able to provide bigger incentives than EnergyWorks could. In addition, PGW benefited from increased customer satisfaction by offering the program, so the program evolvement and partnership was a win-win for everyone involved. For more information, see the U.S. Department of Energy’s Focus Series Interview with Philadelphia Energy Works. Michigan Saves, formerly BetterBuildings for Michigan, established a partnership with Grand Valley State University (GVSU) to take the program’s community-based approach to a new type of community—university staff—through a semester-long, employer-assisted initiative. The program found that the sustainability staff members at GVSU were interested in the program, and program staff described a “sustainability ethic ingrained in the school’s culture.” GVSU employees were receptive to the energy efficiency message. University leadership joined in as well, with the provost’s office and university president writing letters to staff in support of the program. The school’s human resources department helped the program develop a database to manage services to employees. As a result of the program, 215 people working for GVSU (nearly 10% of total employees) signed up for the program. By going through the university, these sign-ups cost one-fourth to one-third of the program’s normal marketing cost per person. Sixty percent of the homeowners who participated in the GVSU program undertook home upgrades, which was higher than Michigan Saves' average rate of 44%. To learn more about the effort, see the interview with program leads: “It’s Academic: BetterBuildings for Michigan Partners With University to Reach Employees”. This report contains information on the market for home performance upgrades and the opportunities that exist for new home performance contractors; start-up needs and costs for firms entering the home performance contracting industry; home performance business approaches; and how established home performance contractors attract customers. It also contains detailed profiles of eight successful home performance firms across the United States. The RePower programs in Washington State convened local community leaders, organizations, contractors, and program partners for a planning summit to consider the benefits and challenges of different business models for the post-grant period. Participants considered four models: non-profit organization, utility, county or city government, and private sector. This report examines the opportunity for accelerating Fort Collins’ energy and climate goals to reflect the community’s values, and capture economic, social, and environmental benefits. This business plan is organized into nine chapters. Chapter I provides background on the business plan concept and describes the organization of Southern California Edison Company's (SCE's) plan. Chapter II presents SCE's vision of EE in California, including discussion of important policy issues. Chapter III provides a summary of SCE's proposed EE portfolio including: SCE's vision and goals; drivers of EE; high-level strategies to achieve its vision; how SCE will comply with the requirements for statewide administration and third-party solicitations; key portfolio data such as budget, forecast energy and demand savings, cost-effectiveness; and proposed metrics. This business plan outlines Pacific Gas and Electric Company's (PG&E's) high-level approach to achieving state energy efficiency policy goals through 2025. This business plan outlines California Central Coast Regional Energy Network's (3C-REN) core design elements - the crucial component of a phased implementation approach to overcome potential barriers, forecasted budget requirements - and shows how measuring success with a comprehensive set of metrics and tools will lead to the anticipated program improvement outcomes and market transformation goals. This business plan outlines the Bay Area Regional Energy Network's (BayREN) ten-year vision, with goals, strategies, and tactics to increase the access and availability of energy efficiency services to a broad range of ratepayers and sectors, including moderate income residents, multifamily property owners, small and medium commercial businesses, and local government municipalities. This presentation highlights key plan elements that helped a Denver energy efficiency program reorient toward success. This presentation explains the pro forma spreadsheet used by Virginia's Local Energy Alliance Program to evaluate program impact. Transitioning to a Utility Funded Program Environment: What Do I Need To Know? Presentation that provides insights from a utility executive on how energy efficiency programs can effectively partner with utilities. The Market Position & Business Model Implementation Plan Template will help you develop a strategy for planning, operating, and evaluating your business planning activities. Worksheet for program administrators to map out their programs' business model framework. Sample business plan framework for a program seeking to operate as a not-for-profit entity. Sample business plan framework for a program seeking to build private sector capacity then phase out and stop operating. Sample business plan framework for a program seeking to operate as a marketing contractor to a utility. Sample business plan framework for a program that establishes itself as a government entity, then operates using a fee-based structure. This guide provides a series of questions that will help to develop a baseline assessment in energy efficiency, renewables, or other services programs. The Better Building Clean Energy for Low Income Communities Accelerator (CELICA) was launched in 2016 to help state and local partners across the nation meet their goals for increasing uptake of energy efficiency and renewable energy technologies in low and moderate income communities. As a part of the Accelerator, DOE created a set of low and moderate income (LMI) energy data profiles to assist partners with understanding their LMI community characteristics. This LMI energy policy and program planning tool provides interactive state, county and city level worksheets with graphs and data including number of households at different income levels and numbers of homeowners versus renters. It provides a breakdown based on fuel type, building type, and construction year. It also provides average monthly energy expenditures and energy burden (percentage of income spent on energy). Table showing business model frameworks, their relevance, key metrics, and questions for consideration. Tool to evaluate contractor impacts on program revenue. The MPower Toolkit provides templates, resources, and lessons learned to address the barriers faced by the affordable multifamily housing sector when accessing energy efficiency upgrades. The toolkit is also intended for all stakeholders involved in efficiency programs, including efficiency program administrators, state and local leaders, utilities, energy consultants, and financial partners. MPower's core model is useful for all building types. In addition, the toolkit’s chapters are broken out into segments that highlight information and innovations that many efficiency programs are incorporating into their own models. The toolkit is a resource for all practitioners involved in implementing MPower and also serves to assist practitioners of other established efficiency programs. The MPower Toolkit draws from the experience of MPower Oregon, although it differentiates between the core MPower model and how MPower Oregon implemented this model. The Small Town Energy Program (STEP) toolkit gives a complete overview of STEP from planning to implementation. It also includes access to a wide variety of materials developed by the program, including: local asset materials, partner materials, personnel materials, program administrative materials, outreach materials, and surveys. STEP has posted these toolkit documents with the hope that it will assist other small towns and communities in building and running more energy efficiency programs. Presentation aimed at program administrators summarizing business model elements and their usage (i.e., governance, financial structure, assets & infrastructure, and customers). This presentation is aimed at program administrators and describes business planning concepts such as program mission, vision, and goals. Presentation aimed at program administrators that highlights the elements of an income statement, methods for forecasting costs and revenues, the importance of performance measurement, and potential revenue streams. This summary from a Better Buildings Residential Network peer exchange call focused on changing an organization's home performance business model and expanding the services offered. This summary from a Better Buildings Residential Network peer exchange call focused on how energy efficiency could be used to achieve other goals. It features speakers from the City of Orlando and Seattle City Light. This report documents the results of an analysis of the electric end-use energy efficiency potential in the U.S. single-family detached housing stock. Technical and economic potential estimates inform the role that residential energy efficiency plays in addressing the objectives of reliable, affordable, and clean electricity for residential end uses. The NorthernSTAR and U.S. Department of Energy Building America Program partnership investigated a new model to deploy building science-guided performance solutions to homeowners. This research explored three aspects to market delivery: 1. Understand the homeowner's motivations regarding investing in building science-based performance upgrades. 2. Determine a rapidly scalable approach to engage large numbers of homeowners directly through existing customer networks. 3. Access a business model that will manage all aspects of the contractor-homeowner performance professional interface to ensure good upgrade decisions throughout time. This report develops projections of future spending on, and savings from, energy efficiency programs funded by electric and gas utility customers under three scenarios through 2025. Browse key topics that many residential energy efficiency programs need to address. Select a topic below to see curated resources, including case studies, presentations, tools, calculators, templates, and more. See a full list of all common search topics. If you have suggestions for additional topics, please tell us.